National Dog Day | A.B.E. Remodeling, INC.
We wanted to give a shout out to all the furry friends out there. Those "kids" with four paws in your families. Apparently there is a "national" day for just about everything. 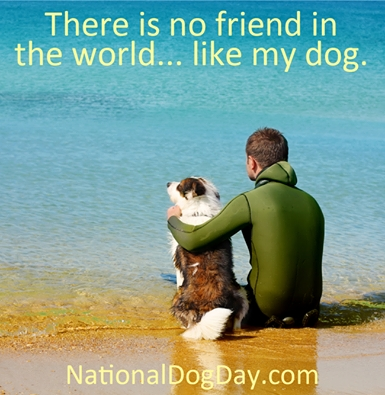 Well, I understand through social media that today is " National Dog Day " so I thought we'd jump on board with that and wish you all... that have a favorite dog or two a very HAPPY 'DOG' DAY. Enjoy your fifi or fido or buck or spike just a little bit more today - give em' an extra treat for them being so sweet. Thinking about it though, for everyone who has a faithful "ole Yeller" we don't need to set a day aside to recognize them. We recognize them everyday - for they are "best friends" and they love us unconditionally. They don't talk back and don't expect all that much. They just want some lovin' , food & water. SO today "Let's hear it for the dogs"!! and have a pleasant day everyone. We would love to hear back from you.... what's your dog's name and type of dog or just give us your favorite dog's name. We sure would like your comments. All right everyone, all the best on this beautiful Wenesday in August.